Replaces Johnson Evinrude 5004938 (435020), 336561 and 337774. This is a brand new gear set. It includes forward gear, pinion gear, reverse gear and clutch dog. *** This gear set may also fit many other V6 models up through the year 2006. If you contact us with your year, horsepower and MODEL NUMBER we will be happy to double check for you! 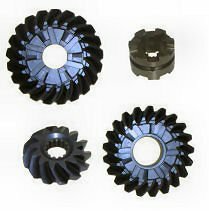 If you do not see your application listed belows, please look at our part number TM2217 for those applications that require the "small" reverse gear. We also carry your seal kit! 225 HP all models from 1991 - 1999.